I selected the book for December: I could not stand another angst-ridden introspective, so we are moving to a fast-paced thriller. 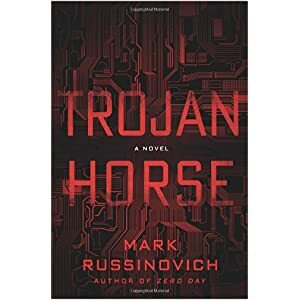 Trojan Horse is the sequel by Mark Russinovitch to Zero-Day we read in July 2011. Zero-Day's plot device was rootkits which describes malware that hides itself inside a computer system by preventing its associated files from discovery. Russinovitch was the one who discovered the Sony rootkit on music CDs that attempted to enforce DRM on their music. The term Trojan Horse is a description of computer malware that masquerades as something helpful, but opens up remote access.